Drosera, commonly known as the sundews, comprise one of the largest genera of carnivorous plants, with at least 188 species. Sundews thrive in places where they can receive full sunlight for at least 8 hours a day. The most ideal place indoors for Sundews is at the windowsill or balcony parapet where there is ample natural light. Artificial light is sufficient as long as it is very bright and not too hot; e.g. placing the plant 4”-7” below fluorescent light. The light will bring out the red or pink in mature leaves. Insufficient light will cause the plant to produce less of the sticky dews on the tentacles at the end of the leaf. Growing tropical sundews in Singapore is fairly easy as we have sun all year round. Sundews flourish in mineral-poor acidic soils. A combination of 1/3 clean sand/perlite and 2/3 peat moss can be used. It is not advisable to fertilize your Sundews. Periodic flooding of the soil is advisable but remember to provide good drainage. Some sundews such as Drosera intermedia, D. tokaiensis and D. burmannii seem to grow well even in deep trays of water. 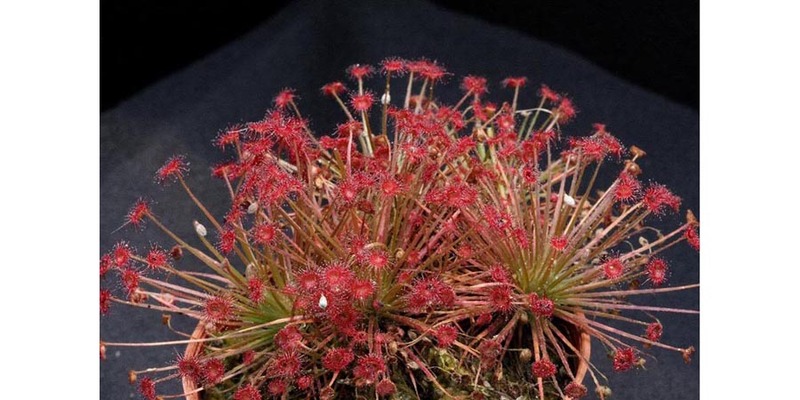 Others sundews such as D. paradoxa, D. ordensis and D. broomensis, all belonging to the petiolaris complex group, seem to prefer less wet conditions. Sundews appreciate high humidity and will grow well in a moist environment.